If you’re like most young professionals, everything is on your phone these days. In fact, you don’t even have to be that young to master a smartphone: my mom explained to me the other day how to use the Starbucks mobile app. But whether you’re paying for coffee with your phone or using Tinder to online speed date, it seems like more and more businesses are turning to smartphone apps in order to reach us(and our wallets). I know that the first thing I check every morning is my phone and sometimes I don’t even put my glasses on first to see what I’m reading. My morning routine is pretty straightforward and probably very similar to a lot of other young professionals. I check my e-mail and social media accounts, maybe browse the news a bit, but that’s where I start to diverge. Every morning, I do a full review of the past day’s financial transactions and once a week I’ll even calculate my net worth. It’s not that I like seeing how much money I’ve made, but I like to stay on top of my spending(it’s kind of an obsession actually). I know that isn’t the first thing most people like to check on in the mornings but I am a personal finance blogger for a reason, I love this stuff. Although I use a few tools of my own, there aren’t a ton of great apps out there to track your spending. 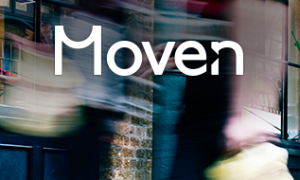 Moven is a new app that is here to change things though, they boast a user-friendly interface and real-time tracking of your spending. Most of my readers already know about the disdain I have for the big banks but Moven is something different. I really like the fact that their company is geared towards simplifying savings and really just making it more fun. Everything from their mobile app and payment system to checking your accounts online meshes well with my on the go lifestyle. Moven has a couple unique payment methods. You can attach an RFID sticker to the back of your phone and pay at any Mastercard payment console or you can use their all in one card. I really like the idea of RFID payments but not many businesses actually employ them. So instead, I use the Moven payment card which acts as a credit, debit and ATM all in one. Although you can pay with the credit or debit option, the Moven card is essentially a debit card since every payment is immediately withdrawn from your account. Although you won’t get any credit card rewards using Moven, I think it is a great starting point for those looking to analyze their spending. Any time someone asks me how they can save more money I usually recommend two things: start paying with cash and keep all of your receipts for an entire month. Moven actually does exactly that and more since they give you the ability to analyze your spend in real time. 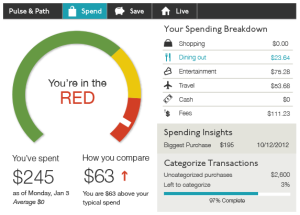 The coolest part about Moven are the tools that they have available to help you analyze your spending after the fact. Every time you pay using your Moven card, their MoneyPulse service will alert you through e-mail or the smartphone app with spending feedback. I think this is one of the most valuable features of Moven. Often times you might think you’re not spending much on going out or buying drinks at the bar but after you buy a $50 round of cocktails for you and your friends and receive a notification telling you you’ve spent $300 on alcohol and bars this month, that might make you slow down! Although it seems like a simple thing, Moven does a really great job of categorizing and labeling transactions. I can’t tell you how many times I’ve had to go in and re-label and re-categorize the most basic purchases like gas or groceries with other money management services. Ultimately I’d like to see Moven interface more with social media and let you compare things like your spending in certain categories to the spending habits of your friends. In the past, I don’t think people would have been willing to share that type of information but today almost nothing is off limits. It could be a really good motivation tool to help you save money if you could see how your dining out budget compared to your friends, males/females your age, or even all 25-30 year olds. As it evolves, I think there’s a lot of potential for Moven to become a one stop shop for your entire financial profile. They’re already implementing things like online online bill pay and mobile check deposit and as a start-up there’s only room for more growth. Ultimately, if someone came to me and asked me how they could start saving more and take control of their financial future I would recommend Moven in a heartbeat. Their unique interface and payment analytics make it fun to follow your finances and encourage you to save money. Moven sounds like a great way to help people learn how to budget their money. I think the hardest part for most people is learning to track their spending. But Moven sounds like it would be the best option and it will allow them to track it in real time! “As it evolves, I think there’s a lot of potential for Moven to become a one stop shop for your entire financial profile. They’re already implementing things like online online bill pay and mobile check deposit and as a start-up there’s only room for more growth.” It really does sound like an extremely helpful tool to people, and if it allows you to keep that close of an eye on your spending its ok in my book! Yea it really is pretty nifty but I think they still have to make it a little bit ‘cooler’ to appeal to the masses. Just from looking at the click through rate of the article I can tell that the topic is not very clickworthy haha. Maybe I totally missed it in the article, but does Moven only track your spending when you pay with them? Yes but you can add other accounts. I think right now it’s better to use them if you want to use their all in one card though as I had some trouble adding other accounts in. How long does it take to get the card? It’s been a while but I believe it took a week or so. Is there foreign transaction/atm fees with moven? Yes I believe there is. Can me and my wife have a joint account with Moven?